We limit our open enrollment periods to a few weeks each year—sign up now so you don’t miss out next time enrollment opens. Get on our course waitlist. Your all-in-one Irresistable Sales Bootcamp for Photographers. This signature class teaches you how to transform from barely-booking to being consistently SOLD OUT with high-paying dream clients you love working with every day. Learn the art of persuasive sales from attraction to convincing + converting, pitch perfect sales system and up-sell frameworks, how to price to win BIG, email script blueprints that have your clients begging to book (in person or phone), and much more. Even if you’re unknown, just starting out and don’t have fancy gear! Learn the what, where and how to go get your dream photo clients booking you SOLD OUT. 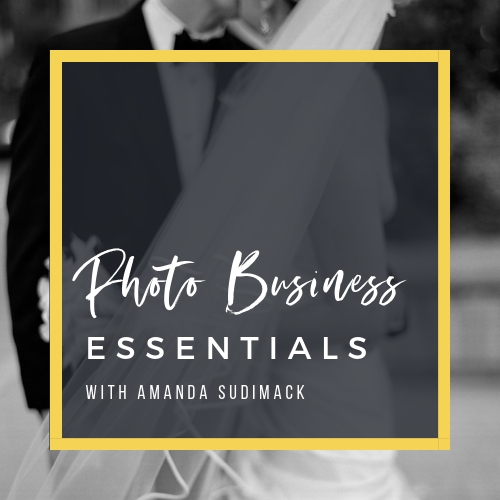 This business-in-a-box program walks you through the must-have foundations of going photo biz pro and gives you every essential tool, legal form, checklist, client guide and strategic frameworks to be successful in your photo studio. Everything you need to quickly jumpstart your photo business with ease is inside to simply copy, paste and go get dream high-paying clients with confidence. You’ll save time, skip over the photo-studio-admin overwhelm, where-do-I-start paralysis and confidently go from side-hustle to super organized photo business boss in less than 4 weeks. Your complete Associate Teams for Photo Business class. This action-by-action program walks you through the how, where and why to find, build and maintain a profitable Associate Team Tribe strategy to ensure you get more clients, create (passive) income, stop turning away work because you're booked and give you more time working on your business and less time in your business.